UPPER WEST SIDE — Kosher chefs, grab your chopsticks. Donburi, a traditional Japanese dish, was crowned the winner Thursday of the Man-O-Manischewitz Cook-off, an annual event that showcases recipes made with ingredients from Manischewitz, the country's largest purveyor of kosher food. More than 3,000 cooks submitted recipes for the competition, which awarded $25,000 worth of GE appliances to the grand prize winner, Stuart Davis of Cherry Hill, New Jersey. Davis, who prepared a chicken and egg donburi, also called a rice bowl, cooked his dish along with four other finalists at the Manhattan Jewish Community Center on Thursday. The five culinary competitors had one hour to whip up their kosher creations at stoves set up in the JCC auditorium. Then a panel of celebrity judges, including French chef Jacques Pepin, rated the dishes. 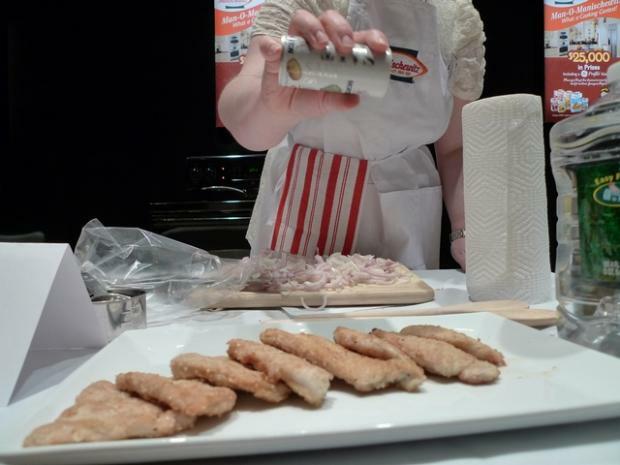 Competitors had to use two Manischewitz ingredients, including the company's new Ready to Serve Broth. Dishes were limited to nine ingredients, and were scored on taste, ease of preparation, creativity and originality. As the five cooks bent over their cutting boards Thursday afternoon to cook fresh versions of their recipes for the judges, a crowd of Manischewitz executives and contestants' families and friends sampled versions of the dishes that had been prepared by caterers. Manischewitz CEO Paul Bensabat said he was partial to the two recipes with a Moroccan theme — a golden sweet potato tagine and a Moroccan chicken bowl — because he was born in Casablanca. Jeanette Nelson, a mother of three with a Southern drawl from Sophia, West Virginia, made the tagine, and Naylet LaRochelle of Miami cooked the Moroccan chicken bowl. The two other finalists were Dina Burcat of Baltimore, who cooked shallot-smothered chicken, and Suzanne Banfield of Basking Ridge, New Jersey, who made fisherman's stew. "The beauty is that we have contestants who are male, female, East Coast, West Coast, Jewish, not Jewish," Bensabat said, adding that only two of the five finalists were Jewish. "We want to demonstrate the incredible versatility of kosher cooking. Kosher food should not be boring. It should be a culinary pleasure." As the crowd feasted on the final recipes, Pepin walked to each station and chatted with the contestants. A veteran of cooking on camera for several TV cooking shows, Pepin told DNAinfo he had advice on how contestants could stay calm under pressure. "Have a glass of wine," he said. "You have to relax." When the hour of cooking ended, each finalist presented their dish to the judges. "Just like every Jewish mother has their version of chicken soup with matzo balls, every Japanese mother has a version of this," said Davis, who lived for several years in Japan. When he was announced as the winner a few minutes later, he beamed and encouraged the crowd to try his recipe. "Make it at home, the low sodium broth works great," Davis said.